Celebrations are often ideal occasions for gathering round with family and friends, serving up mouth-watering recipes featuring pork. Moving forward into new seasons and new ventures, pigs are symbolic to moving ahead as they progress forward in search of bounty (or a little grub), comparatively far more ambitious than the rambling forward and backward hunt of other animals, such as chickens and turkeys. Decades ago, families saved the best cuts of pork to feast upon during such occasions as New Year's Day and other joyous festivities. Today, continuing age-old traditions, we celebrate prosperity and progress with savory pork loin recipes that are "The Taste of Now". 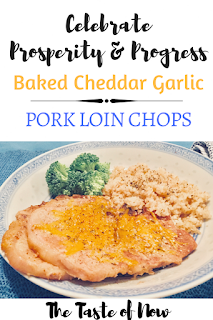 Thank you to the National Pork Board for their sponsorship of this Taste of Now post with a promotional item and nutritional content information and recipes. 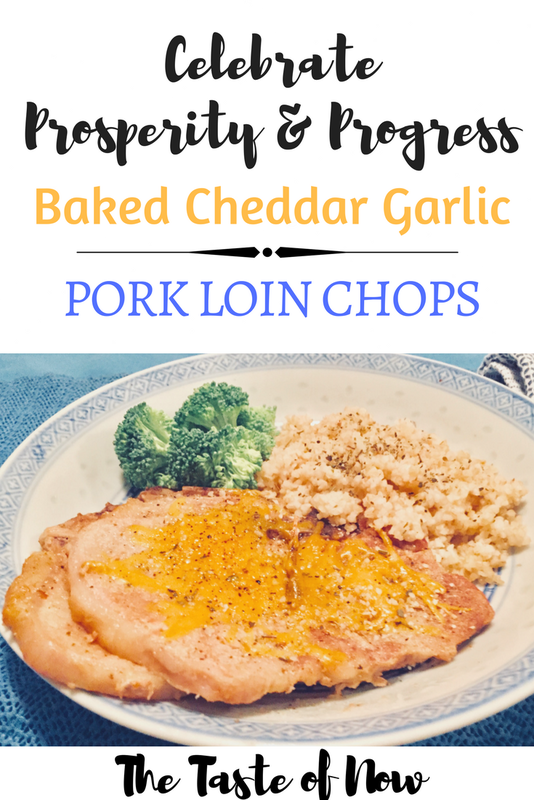 Simple preparation with delectable seasoning brings out the flavor in this lean cut of fresh, choice pork. 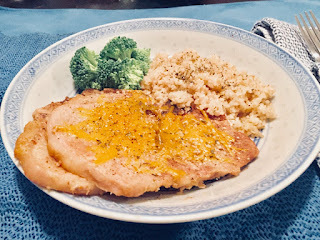 Drizzle olive oil over pork loin chops in baking pan. Combine garlic powder, onion powder, sea salt, and black pepper. Sprinkle seasoning mixture over pork loin chops. Bake pork loin chops at 375°F for approximately 20 minutes or until lightly browned and internal temperature reaches between 145°F (medium-rare) and 160°F (medium), on a meat thermometer. Sprinkle shredded extra sharp cheddar cheese over baked pork loin chops. Remove from heat and allow flavor to saturate for 3 minutes. Serving meals featuring lean cuts of pork has become the Taste of Now. With versatile, affordable, flavorful servings of pork, we are able to simply include these cuts of meat as part of healthy and balanced diet. Pork, now factors in with other meat and poultry as low in fat, calories, and cholesterol. 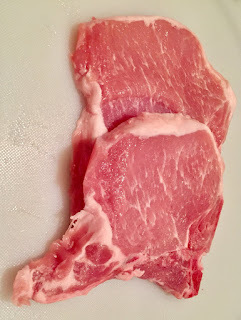 Providing a source of vitamins, nutrients, and minerals, many lean cuts of pork are as lean or leaner than chicken. Celebrate prosperity and progress, or discover plenty of pork recipes and nutritional facts for more of the Taste of Now.